Did you know? Goggles are allowed, but not recommended. A child who relies on goggles may be reluctant to swim if they are forgetten. 1. Why is class time used for safety skills? Safety is an important use of time. 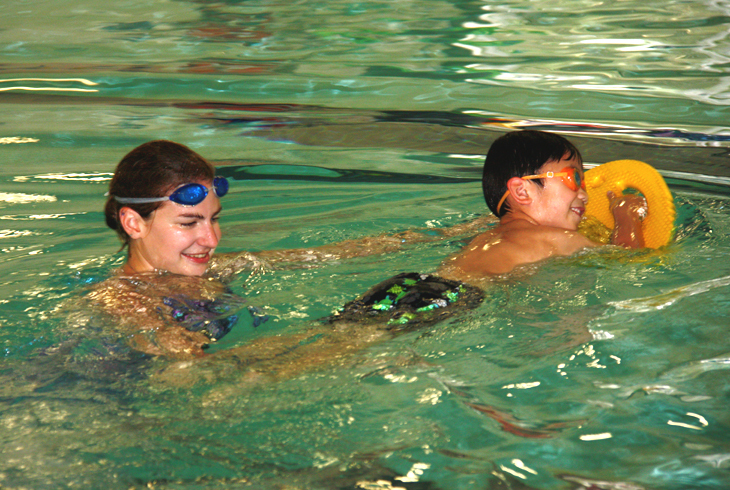 The American Red Cross Learn To Swim program tries to incorporate the safety tips into the daily lessons. Most “safety days” are kept to a minimum. Some “safety tips” may be longer depending upon the pool conditions (i.e. cold water due to an upcoming special event). Children often learn through repetition. 2. What is the water temperature of the pool? 3. Should my child wear goggles? Goggles are allowed as long as they do not interfere with the class. However, we discourage goggles at the beginning levels so the children can learn to explore. A child who relies on goggles may be reluctant to swim the day if they are forgetten. 4. I like my child’s instructor. May I request the same instructor next time? Instructors are scheduled based on the classes offered and the demand. It is not always possible to have the same instructor. Children often benefit by experiencing a variety of teaching styles. 5. How long will it take my child to pass the levels? Children vary when it comes to learning the skills in each level and gain confidence in their abilities, rather than how quickly they progress through the levels. We want this to be a pleasant experience and allow children to learn without being pressured. 6. What if I have a question for my child’s instructor? It is best to leave a message for the instructor at the front desk. Please be aware the instructors often go from one duty to the next with only a few minutes in between. The instructors will be happy to discuss your child’s progress. Please do not wait to voice your concern until the end of the session. 7. What if I signed up for the wrong level? All children are skill tested on the first day of class. If a situation arises where the child is not in the appropriate level for their skill ability, every effort will be made to place that child in an appropriate level, based on availability. If an appropriate level class is unavailable at the same time, we will offer to transfer your child to the class time where there is an available opening. 8. Why are some levels combined? In the event that some classes do not fill, we will combine compatible levels in order to prevent the cancellation of classes. If your child is in a combined class, the instructors continue to work each child at his or her own level/pace. 9. How do I know if my child is being taught at the appropriate level? If you have any questions as to your child’s progress, please contact the instructor, who will be happy to discuss your child’s progress with you. 10. What if my child is new to lessons and cries? It is not unusual to become nervous with new situations and the separation from their parent. The instructors are very understanding and experienced in dealing with the fearful child. It is best to allow the instructor to work through the fear and build trust between student and instructor. The child will often relax and have fun during the lesson, but keep in mind this could take a couple of days in extreme cases. We just ask you to continue to be positive and supportive of the instructor’s efforts. 11. What if my child becomes ill during the session? If your child is not feeling well, please do not bring him/her to swimming lessons.He/she will not be able to perform skills and there is risk of exposing other children and the instructor to the illness. Please notify the instructor of your child's illness prior to class. If your child is ill or injured for an extended period of time, we will credit you the unused portion of your class when the request is accompanied with a doctor’s note. 12. What if my child gets “stuck” in a certain level and does not seem to be making any progress? Plateaus are not uncommon while a child is learning to swim. Many times the skills a child is struggling with are usually the skills that take endurance or coordination of multiple skills. We make every attempt to provide a variety of drills to help the child attain these skills, but it just takes time and patience. To prevent your child from becoming frustrated, please remain positive. We also recommend that families come to the pool for open swim for playtime. This reinforces the positive aspects of swimming that helps the child relax, which will make learning the skills easier during lessons. Also keep in mind that the children need additional practice outside of lessons. Open swims would give the child that opportunity.